A team of six emergency experts from the United Nations Office for the Coordination of Humanitarian Affairs deployed to Papua New Guinea to assist the government in response to the earthquake disaster efforts in the Highlands. The team will assist the PNG National Disaster Centre in assessments, response coordination, logistics and information management in the worst affected areas especially in Hela and Southern Highlands provinces. 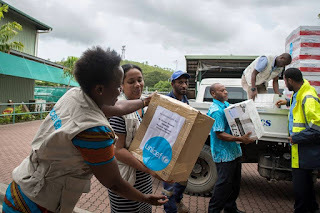 The UN has initially mobilised USD 1.4 million (4.6 million kina) to support relief efforts, having already dispatched immediate relief supplies to the earthquake affected areas such as tarpaulins, water containers, emergency medical items including, medical kits, vaccines and malnutrition treatment supplies. “From the United Nations in Papua New Guinea, we would like to extend our sympathies to those affected and to those who have lost their loved ones,” said UN Resident Coordinator, Gianluca Rampolla. “We are working with the Government of PNG, our partners and other humanitarian organisations to support relief efforts and we will continue to provide technical, logistical and coordination support where needed,” said Mr Rampolla. An earthquake measuring 7.5 Magnitude occurred on 26 February 2018 in the Southern Highlands of Papua New Guinea. The Prime Minister Peter O’Neill declared an immediate State of Emergency on 1 March 2018 for the disaster affected areas in Hela, Southern Highlands, Western and Enga provinces.